Caroline “Judy” was born Saturday July 10, 1937 to William Charles and Clara Hannah (Mole) Friest in Wiarton, Ontario. William, a labourer, and Clara, a housekeeper, were both Baptist and were married in Wiarton on the 16th day of May, 1921. William, born in Wiarton, was thirty-one and Clara, born in Clavering, was just eighteen. Their witnesses were Robert Mole and Martha Mole of Clavering, Ontario. Charles and Julie Ann (King) Friest were William’s parents and William and Mary Ann (Welsh) were Clara’s parents. Rev. Hugh McFarlane, Presbyterian, was the presiding pastor. Caroline was Judy’s given name and she was the youngest of nine children; Lillian (born 1922-1954), Raymond (1924), Norman Ira (1926-1988), Necia Clara (1928-2006), Gladys Martha (1934-1934), Sonia, Nona and twin brother Carl who died within his first month. Poor Carl was an underdeveloped infant and died suffering from asthenia, an abnormal physical weakness or lack of energy, due to heart failure. William died May 21, 1974, in his hometown of Wiarton at the age of 86 and Clara died April 20, 1976 in Owen Sound. Presumably Judy was given her nickname, by her Dad, from the “Punch and Judy” show! She always said the Caroline was her “government” name! Judy was raised on the edge of Wiarton, towards Colpoy’s Bay, and attended public school in Wiarton. At some point she courageously set out for Toronto to find work. A couple of her sisters were living in the Oakville/ Mississauga area and that is likely how she ended up in Toronto working. There she worked as a labourer in the industrial segment of the work force. In time she met William “Bill” Yager, only son of Randall (1898-1989) and Rhea E. (1912-1939) nee Galbraith) Yager who was living in Chesley. They were married in the Fall of 1959 at Geneva Presbyterian and together they had three children; Randall “Randy” Ross (1959), Kelly Rhea (1963) and Paula Maire (pronounced Marie) in 1968. Grandpa Randall lived with the Yager family up until his death as he was widowed shortly after Bill was born. Judy was always industrious and while living in Chesley cleaned at the Marklevitz’s butcher shop. A funny story is told of the day Judy worked for a hairdresser for just that one day! She was never one to put up with a lot of grief. Judy also worked hard for her family. Every noon the children had a hot meal served to them and Judy was meticulous about cleanliness. Judy had a keen sense of smell and often would be the first to detect and react to odours, good or bad, in her surroundings. She loved to garden and had both large vegetable and flower gardens. Canning and preserving took a lot of time and of course, washing was done in a washing machine just one step up from a winger washer. The clothes were then dried on an outside line or her huge clothes horse inside the house. When there was time to relax, Judy enjoyed playing “Trouble,” but the Yager family played few board games or cards. The children were to spend time outside or with their Dad Bill at the racetrack in Hanover. Judy was often too busy to watch TV, but when she did it was “Little House on the Prairie,” “Gun Smoke” and “Little Big Shots.” Gathering the residents together at Elgin Abbey to watch these programs was something Judy did frequently and with enthusiasm. Playing Bingo was yet another enjoyed pastime! In 1980 Judy and Bill separated and she went on to live in an apartment above the old Enterprise building. She went onto live, and work, as a caregiver in Southampton, Hepworth and eventually back in Chesley. In time, Judy was able to finally retire. Her grandchildren could often find Judy downtown on a bench outside the Post Office. In her newly found free time, Judy loved to paint, draw and work on her flower gardens. She loved to pet sit – for both dogs and cats. She loved her four-legged creatures. Judy also became a Red Hat lady and had lots of fun participating with them! Judy lived in an apartment above the old Stedman’s Store and then in the apartment building on 4th Street. A memory is cherished of Judy’s tomato plants that she grew there on her balcony. In time, Judy was blessed to rent a house with a front and back yard as well as a kitchen with windows! Brenda McLean was her landlady and their true and fast friendship continued to deepen. Even though Judy was a concrete thinker in life she was very abstract in the planning of her many flower beds. Her flowers grew in a chaotic order, giving beautiful colour and heights! She loved her rhubarb plants and the herbs she often used in her cooking. Judy was a great soup-maker, soups with substance and great flavour. To bake a pie was like breathing to Judy, she could do it in her sleep! Apple pie with a slice of old cheese was a favourite of her father-in-law Randall and the apples often came from her own apple trees! In addition, Judy was well known for her Date Squares. She loved cooking and was especially good at making liver and onions! Beautiful pictures bring to mind the weddings of Judy’s three children. Kelly and Steven were married in 1985, Paula and Gary in 1989 and Randy and Debbie were married in 1992. These unions fashioned grandchildren for Judy; Ryan (1984), Tyler (1992), Kyla (1995), Amber-Lee (1988), Candice (1991) and Styles (1992). Special letters were shared between Kyla and her grandmother. Judy loved to keep in touch with relatives. She spent time with her nieces and their children. In fact, it was mentioned Judy was “a favourite” aunt to many! Memorable moments were shared with them. Dorothy’s visits were known to be filled with uproarious laughter and vibrant conversation. A very special 80th birthday party for Judy was held at Elgin Abbey. Dorothy made sure that she had a photo album filled with pictures taken of her guests as a keepsake of the day. A good time was had by all. Judy was a fine neighbour always generous, caring and hospitable. June 1, 2017 found Judy having to move into the lodge at Elgin Abbey. There she quickly made new friends and was reacquainted with others she knew. She loved spending time with, in particular, Blanche Elder and Bert and Marjorie Steinhoff. Another cute memory is of Judy and Dianne, her supportive inquisitive neighbour, sharing their chocolate milk at Elgin Abbey! Enjoyable time was also spent with Harry Hill. Indeed, Judy enjoyed spending time with family and friends, but also enjoyed her quiet times. She was a historian in her own way, always collecting and saving clippings of the news in her community. Many hours were spent copying out lyrics of songs and poems. She perused magazines at length searching for new recipes, cute pictures of animals, craft ideas and anything else that caught her attention, all of which were neatly cut out and carefully stored, perhaps for use later on. Judy was tremendously organized; she liked to keep most everything and everything was in its place. Cats “Panda” and “Lucky Sandy” as well the dog “Tasha” were well loved. The radio was always on in her homes and she loved the bagpipes which is interesting, yet not surprising, as both the “Friest” and “Mole” names are of Scottish origin. Besides the bagpipes Judy enjoyed any kind of music. Another cute story is also told of how Judy treasured a tennis ball given to her by Styles. The truth of it is, Judy treasured all of her possessions no matter how small or seemingly insignificant. Every item had a story. Her 75th birthday was celebrated out at Brenda’s at Point Clarke where Judy was the “belle of the ball” and she cherished one of the roses from her birthday cake! She loved it at the cottage where she enjoyed the waterfront sights and sounds. Over the last week Judy received many well wishes and prayers. Her family would like to thank everyone for their kindness and generosity. It is clear Judy made a lasting impact on many lives and will be fondly remembered by all. 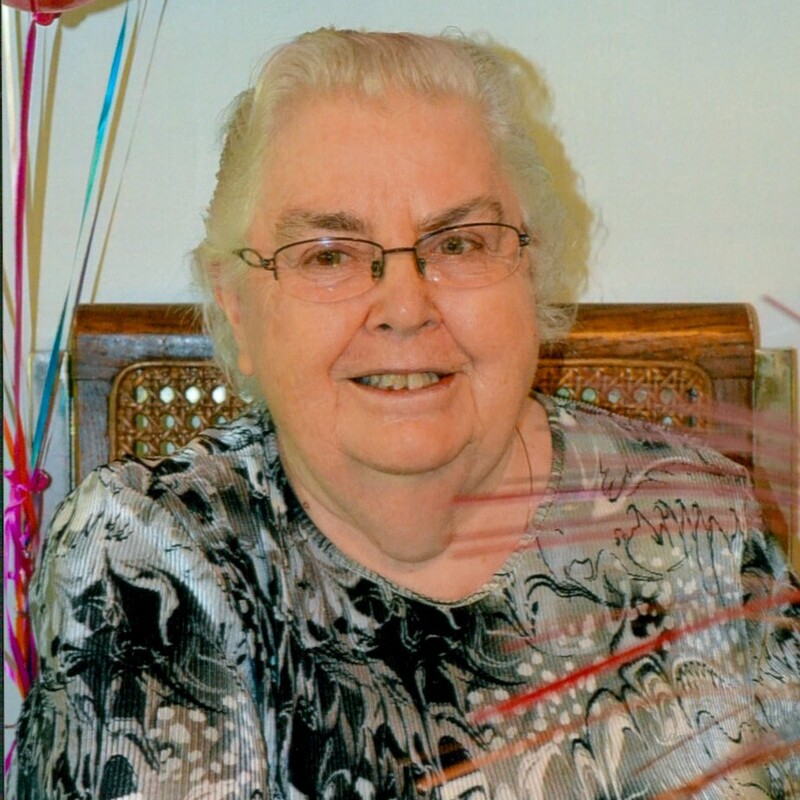 Sadly, Caroline “Judy” Yager of Chesley, passed away at South Bruce Grey Health Centre, Chesley on Saturday, August 11, 2018 in her 82nd year. Loving mother of Randy (Debbie) of Port Elgin, Kelly (Steven) Hallman of Clifford and Paula (Gary) Swartz of Chesley. Judy will be missed by her grandchildren Ryan, Amber-Lee, Candice, Styles (Melinda), Tyler and Kyla as well as her sisters Sonia Ellis and Nona Benson. She will be fondly remembered by her large extended family and many close friends. Judy was predeceased by her siblings Raymond, Norman, Gladys, Lillian, Necia, twin brother Carl and her parents William and Clare (Mole) Friest. A funeral service honouring Judy’s life will be held at Rhody Family Funeral Home, Chesley on Wednesday, August 15, 2018 at 1 p.m., with visitation one hour prior to the service. Interment in Chesley Cemetery. In lieu of flowers, memorial donations to Grey-Bruce Animal Shelter, Epilepsy Ontario or SickKids Foundation would be appreciated as expressions of sympathy. Sending sincere sympathies in the loss of your Mom and grandma. When I think of Judy, I think of a kind and gentle soul who was a hard worker. Mom (Pat Lettau) also sends her condolences to the family. I was the Red Hat Queen Of our group and that is how I met Judy. What a wonderful friend she became! She always cared for others more than for herself. I will miss her! I am so sorry for your loss Randy, Kelly and Paula. My thoughts and prayers are with Judy’s family at this difficult time. She was a fun loving lady and will be missed! My deepest sympathies to the family. She was always a very nice Aunt to all of us kids. Mum loved her alot. Maybe they are sitting together on a bench somewhere. So sorry for your loss Paula and family. Our deepest condolences from Herb and Cathyand Dorian and Emma . Paula and Kelly, please accept my deepest sympathies on the loss of your Mom. I have so many fond memories of time spent together, your Mom was a wonderful lady! May your treasured memories help you through this difficult journey! Randy,Kelly,Paula and families. Our deepest sympathy. We both have fond memories of your mom. May your memories hold you together in the next coming days. Randy, Kelly, Paula & families... my deepest sympathies to you on your mom's passing! Mothers are always special with their special love! Sending prayers of LOVE ❤️, comfort, hope & peace to all of you during this time and forever! Deepest sympathy to Judy's family. She will be missed. Randy, Kelly, Paula and Families: So sorry to hear about Aunt Judy. She really was an amazing lady and was so giving and kind to everyone, especially family. Her hugs were the best!!! Her laugh and smile were infectious. I'm sure Dad and Norma and all the family who have gone before, will be giving her hugz and showing her the ropes up above. Thinking of all of you with deepest condolences. Love you all.